I wonder what it'd be like to have a morning swim easily within reach. I have it, even though my apartment is a rental. 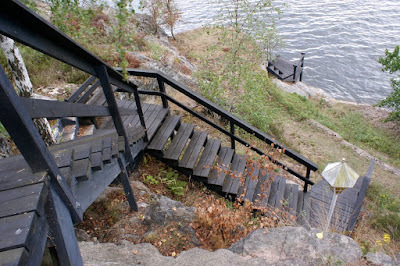 It's overlooking Mälaren in Blackeberg, Bromma and I swam every day this summer. Awesome! I suppose the upstairs climb would count as a downside? Svenske Floyd: Not entirely unlikely! gobzee: Stockholm in a nutshell. All that water in the vicinity can be a real treasure. Thanks for stopping by and do keep warm. I wouldn't like to have to climb those steps. otherwise it looks a lovely location.